West Bloomfield resident Suzanne Levine was one of three individuals honored recently for overcoming obstacles to employment with help from JVS. 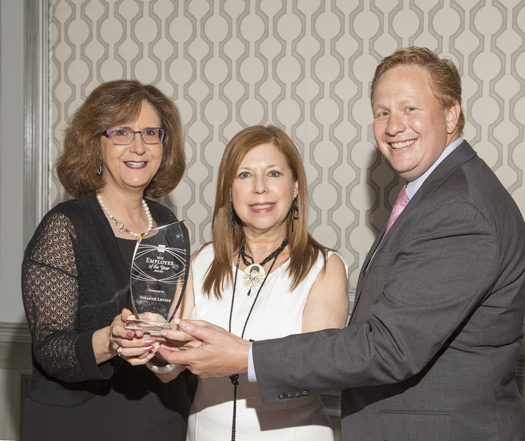 Levine received the Employee of the Year Award on June 11 at JVS’s 18th annual Strictly Business Networking and Awards Luncheon, in front of a crowd of more than 700 business and community leaders. Levine was recognized for re-inventing herself after a 25-year career in television and video production. As the market for independent producers declined, Levine came to JVS for help in making a career change. Statistics reveal that, on average, people transition to a new career five to seven times throughout their working lives. Levine landed a position as executive director of the Greater West Bloomfield Chamber of Commerce, where her creativity, resourcefulness and problem-solving have helped the organization grow. In a video prepared for the awards event, Levine says she especially enjoys the opportunity to work with local business owners to help them be more successful. View Levine’s video at www.jvshumanservices.org/strictlybiz. One of the businesses she’s helped is Vector Associates, a website design company headed by Scott Simpson. He met Levine shortly after launching his business, and credits her with connecting him with several new clients. In addition to Levine, JVS honored two other individuals with Employee of the Year Awards: Wayne Crowder, case manager at Neighborhood Legal Services Michigan, and Roxann Zimmerman, greeter at Meijer in Northville.